What a cool get-together. Several friends from Oceanside and a few from the 814 met this morning in a sort of informal church service. We went through the first part of the Sermon on the Mount: the Beatitudes. Good stuff. Discussed which ones troubled us or brought us hope. Also considered the idea that this was Jesus' way of affirming the 'least of these' in a society that promoted power, prestige, and self-centeredness. Here was Jesus honoring those who were the lowest in society. I mean really, did he believe the meek truly would inherit the earth or that the peacemakers (and not the warmongers) are those who are truly living 'in' the Kingdom of God. Wow. Tell that to our politicians who think they can bring peace by the sword. And how about the statement that Jesus makes about those who hunger and thirst for right living will find themselves quenched. I mean, aren't we told to believe that only in thirsting for being on top or by being promoted or by acquiring more and more will we be truly fulfilled? Isn't that the American Dream: that you actually can be happy with all this stuff? Good morning it was. Cool. Let's see where this thing goes. I think my neighbor James is even more excited about it then I am! Wow. Cool. So, an interesting story of searching for calling and meaning in life. Just a week or two before we headed to Thailand, one of my neighbors asked me if I'd be interested in leading a sort of church service for the apartment complex. You know, something simple on the beach. Just chill, but cool. I asked him if he thought people would be into that. He replied that he thought several people here were looking for some sort of spiritual connection and that he thought that it'd be a good thing. He said most of these people wouldn't check out a 'normal church,' but might get into something like this. So, we got back from Thailand and he approached me again about doing it. Of course I said that I would. What a cool opportunity. So, tomorrow morning, some of our friends from the 814 and from Oceanside are meeting at the beach in front of our place to do a simple little service. Wow. How cool. And it wasn't even my idea. For more of Dixon's great thoughts on rethinking short-term missions, go here. Stop trying to do the right thing and do the good thing instead. I have been thinking a great deal about fruit the last several weeks. In an attempt to qualify my life and life's work, I figured the only way Jesus seemed to qualify things was by the fruit of the person's life and by the person's simple obedience to the Father... that is, to live in harmony with God in pure surrender. Fruit cannot be forced. It simply grows from a healthy tree. Where there is unhealth, you will have bad fruit. I have been evaluating the amount of fruit my life has produced. How many people's lives are better for having known me? How many people would call me a bringer of positivity or of God's goodness? Do people want to bear the quality/kind of fruit that I am bearing? Or do they see my fruit as bitter and bruised? Would others like to be planted in my shade or stay far away from my end of the forest? Okay, perhaps I am taking this a little too far. But the point is is that I have been thinking about fruit as a measuring of success lately. I have also been thinking about mirrors. How they reveal how we look, who we are. People can be mirrors, you know? Marriage has shown me that. Who can show you better who you are than the person you spend 24/7 with? As with mirrors, people can reveal the best and worst of me. When Holly is at her best, it reminds me of what it's like to be at my best, in my sweet-spot. When Holly is sad, it reminds me of the chambers of grief in my own heart (or the callous of my heart). When Holly irritates me (now this is very seldom! ), it is usually because the same things that I dislike about myself, I dislike seeing in others. Does this make sense? And so I begin looking at how others live their own lives, what kind of fruit they are bearing, and I let them mirror me if possible. What can they remind me about myself? Which directions to go, which directions not to go, etc. Now of course, different trees produce different fruits and some mirrors are like the ones you find in a funhouse, but a good look around you might show you a little something about yourself... or it's at least showing me a bit about myself. Anyone read anything by this guy? I am looking at this book and this one. Just wondering if anyone has read any of his stuff. A review of the Colossians book that I just finished said this guy had incredible perspectives on Matthew. For all the cynicism I have toward so-called Christian Education and even just institutions on a whole, it is still nice to have my degree in hand. Nice because it is the closing of a 10-year chapter of life. It is time to begin anew. And perhaps Masters work will be somewhere in the future; perhaps not. Who knows? Thanks Chris for this haunting reminder: "25,000 Iraqi civilians killed in this war." 3,000 US civilians were killed in the 9/11 terrorist attacks. Since the start of the Iraq war, more than 8 times that amount of innocent civilians have been killed over there. Can you imagine 8 times the rage and indignation of the US after 9/11? And if some country had inflicted an attack 8 times worse than 9/11 upon the US, would people call it a liberation, despite the nice language or intention? Even worse, I've heard that 25,000 is an extremely conservative estimate and that the number is properly more around 100,000. A conservative body count site. I still don't understand how this 'liberation' can be seen as Christian in any sort of way. Where does loving your enemy come into play here? Or is that yet another one of Jesus' comments that we write off as merely something Jesus did because, well, he was God or something? This was one of the most central things to Jesus' ministry: loving those who were not 'easy' to love. Thanks Jason for this superb link.After my quote of Walsh and Keesmat's book on Colossians, this is a great response. Support local coffee shops. Ask for fair-trade, shade-grown coffee while you're at it. Support not only (possibly) better economic practices, but reinvent the common spaces of conversation that typically don't exist at places like Starbucks any more. I am just trying to admit that I am part of the problem and then try to be a part of the solution. To me, that is what living in the Kingdom of God looks like when it meets the ground. 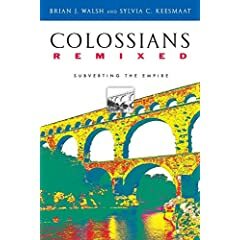 I am continuing in my reading of Colossians Remixed: Subverting the Empire. In fact, I am almost done. I am really thinking of doing a book club through this book if anyone is interested. It is an incredible book... really. There is nothing innocent about economic oppression. There is no room for Christians to be "balanced" and "careful" when we are talking about an economic idolatry that will sacrifice children in its service. Slavery is sinister no matter how it gets packaged. There what are we to do? How do we proclaim Colossians' liberating word [regarding freedom for slaves] to slaves when they are halfway around the world? It's not as if we have any power over their working conditions. It's not as if they are our slaves whom we need to release. But that's just the point. They are our slaves. Every time we step into a Wal-Mart or Niketown or Gap or Winners and exclaim over the great deal we can get on an article of clothing, or how trendy we now look, we've made sweatshop workers our slaves. Every time we buy coffee that isn't shade grown and fairly traded, we've made those coffee producers and their children into our slaves. Every time we have purchased a product–any product–that says Made in China, or Indonesia, or the Philippines, or Sri Lanka, it is pretty likely that we have made someone our slave. But we have no choice about buying products made in those places. Some things can be bought only from these companies! Buying some of these products is inevitable. The language of inevitability is the language of empire. Whenever we hear "We have no choice," our ears should perk up. It is precisely the strategy of the empire to take our imagination captive so that we think we have no choice. When a certain lifestyle seems to be inexcapable, you need to realize that you are imprisoned. Sorry I have been absent here. Hopefully you have been following us on the other blog. First, Colossians Remixed: Subverting the Empire. One of the best books I have read in a long time. I would say it has had as much impact on and resonation with me as when I first read A New Kind of Christian. Wow. Seriously. Wondering how to read a letter of Paul's (someone I seem to have problems with) in a postmodern world? Wondering what a movement of God in the now might look like? Had assumptions about the Empire not being the Ultimate narrative? The the US is not the savior of the world? Then you might just love this book. A bit on the philosophical-sociological side, it is an incredible, thoughtful read. 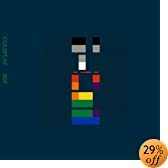 Second, Coldplay - X & Y. Wow. So many good tracks. We downloaded it before we left to Asia from iTunes. Haven't really given it a good listen (Some of our housemates hate Coldplay and U2! Ouch!) until now. Beautiful stuff... really. Okay, we will be back in Oceanside in about 10 days. Much to reflect on then. Cheers friends!